I am a featured chef at the upcoming Feast of Faiths Dinner hosted by the Boniuk Center for Religious Tolerance at Rice University. 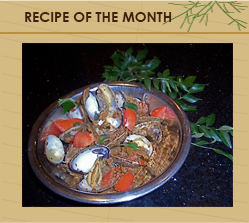 Please join me on June 10 for this Cross-cultural culinary experience. Visit www.boniuk.rice.edu to learn more about the event and to RSVP. UPDATE: Presentation at Museum of Fine Arts Houston, February 25, 2010. 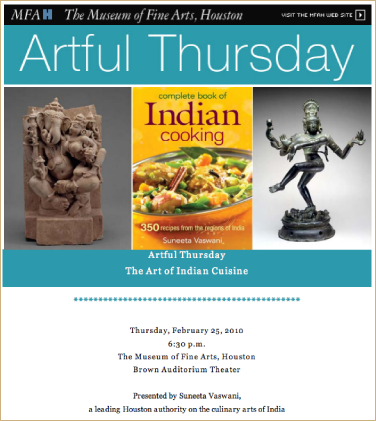 On February 25th I made a presentation at the Museum of Fine Arts Houston on The Art of Indian Cuisine tied into some of the museum's pieces displayed in the recently opened Indian art gallery. It was gratifying to see the enormous support the programme received and the book sales that followed. My presentation focused on the works in the recently inaugurated Nidhika And Pershant Mehta Arts of India Gallery. An exciting project that I'm so looking forward to. The event was open to the public and was followed by a reception for the museum's popular Artful Thursday evenings. The second addition of my first book, Easy Indian Cooking, was released in April, and I am happy to say, appears to be selling well. The addition of 30 new recipes, including a chapter on Chaat – the beloved street foods of India – several new photographs and a gorgeous new cover have made the book a must have. On a visit to Houston, Texas in June, I taught a sold out cooking class at Central Market Cooking School, recognized as one of the premier cooking schools in the US. I am happy to add the successful class led to a spike in book sales. My books are available on Amazon.com and also on Flipkart.com in India. Click here on the image for a PDF with full details of the event.